Pam Wilkins and Johnny Moore give you a few pointers on Pompey’s latest away trip. STADIUM: Victoria Road Stadium, Victoria Road, Dagenham RM10 7XL. The Daggers’ ground has a capacity of 6,000 and Pompey fans will be in the Traditional Builders Stand at one end of the ground. The away end is at the other end of the ground from the main entrance and not well signposted. As you go through the main entrance, walk straight on through the car park, past the social club on your right and then walk along the back of the main stand. The away entrance is down on the right at the corner of the ground. Directions: If you are coming from the south, via the Dartford Crossing – remember you can’t pay at the barriers anymore. Toll charges apply from 6am to 10pm every day and must be paid in advance or by midnight on the day after you cross. Leave the M25 at junction 31 and take the A13 towards central London. After approximately 4.6 miles, exit the A13 on the slip road signed Elm Park and Dagenham East and at the double roundabout turn right, then go under the A13. Continue to the set of lights and turn left on to a dual carriageway. After about half a mile you will see a McDonalds on your right, get into the right-hand filter lane and turn right into Ballards Road. The speed limit is 30mph and there is a speed camera on your left. At the end of this road you will come to a large roundabout with a pub called the Bull, turn left into Rainham Road and go past Dagenham East tube station. Victoria Road is about quarter of a mile further down on the left. PARKING: There is no parking available at the ground but plenty of street parking in the surrounding area, including the Pondfield Road behind the ground and a short walk across the park. nearest train station: The nearest tube station to the ground is Dagenham East, which is on the District line. After exiting the station, turn left and the ground is the fifth turning on the left – about 400 metres from the station. WHERE TO EAT AND DRINK: There is a bar in the away end and there is a social club which, depending on numbers, usually welcomes away fans. There is an entrance fee of 50p and it has Sky Sports and serves bar snacks. There are a few cafes in the main road outside the ground but pubs in the area are few and far between. The nearest, about half a mile from the ground, is the Eastbrook – a large pub which serves real ale and food and has a car park. Opposite Dagenham Heathway tube station – one stop before Dagenham East – is a Wetherspoons pub called The Lord Denman, 270-272 Heathway, Dagenham RM10 8QS. Four stops before Dagenham East, at Barking, is another Wetherspoons – The Barking Dog, 61 Station Parade IG 011 8TU and close by is the Spotted Dog, 15a Longbridge Road, IG11 8TN, which has sports TV and serves food. These are part of a busy town centre with many cafes and takeaways. PREVIOUS MEETINGS: Last season’s visit to Dagenham on a cold forgettable February evening saw a goalless draw with chances at a premium. This was in total contrast to the Blues first visit the previous April. 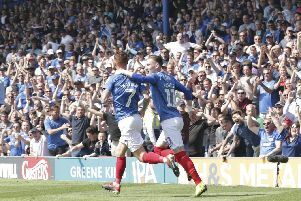 Two games into the Andy Awford reign, Pompey claimed a comprehensive 4-1 victory. Danny Hollands, Jed Wallace and two Michael Drennan goals sealed a third win on the bounce to further ease relegation fears.